These straight transmission oils, without additives, have been formulated for use in conical torque, non-hypoid gear systems such as straight bevel, spiral bevel or worm gears. The choice of viscosity is dictated by the technology used and the viscosity recommended by the manufacturer should be used. As a general rule if the gear change is stiff when the gearbox is cold and becomes easier as it warms, due to the oil thinning during use, the correct grade of oil is selected. 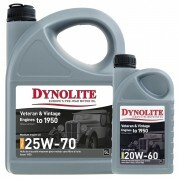 This oil is suitable for axles and gearboxes of light to medium vehicle from the twenties & thirties. This oil is suitable for axles and gearboxes of medium to heavy vehicles from the twenties & thirties. Equivalent to 120,140 and 160W. The thickest transmission oil, also known as 600w ideal for veteran and Edwardian rear axles and where the gearbox needs a high viscosity oil. This is typically used in vehicles between 1918 & 1939. This oil is also suitable for Vintage axles that lose oil through the hub bearings. If you require Semi-Fluid grease for gearboxes used before 1918 then please click here.